In Africa or Asia, monkeys thrive in urban settings. They roam freely in villages and temples. They raid the local food sources, rummage through garbage, and scrounge for any goodies tourists may be keeping in their bags. And in all this activity, they can pass their germs to humans, raising serious health concerns. Tierra Smiley Evans, a graduate student at the University of California, Davis, is implementing a new technique to address viral sharing between humans and primates. She works for a project called PREDICT that aims to prevent diseases that travel from animals to people. 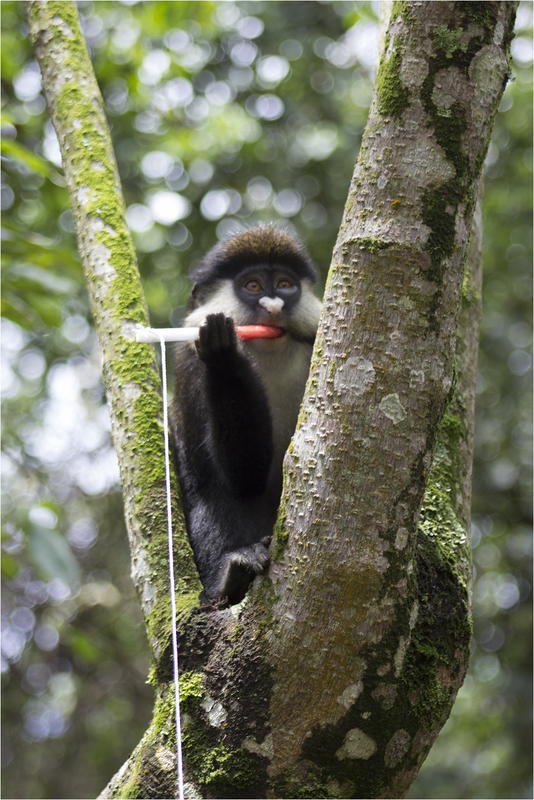 Using only nylon rope and strawberry jam, she has figured out a way to get monkeys to happily offer their spit to be screened for contagious viruses. Smiley tried a similar technique for the first time in 2007, with captive mountain gorillas in Rwanda. But she couldn't test the technique with wild gorillas because of strict laws against distributing man-made devices (like ropes) to endangered primate species. 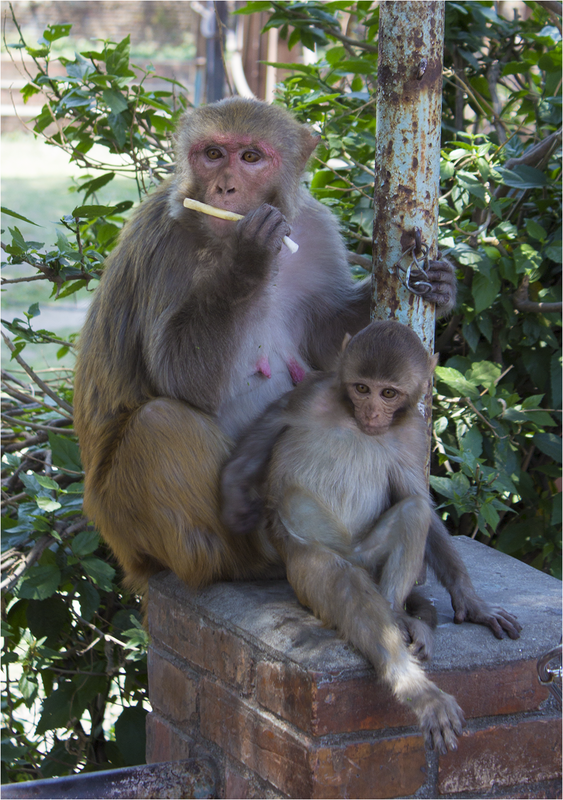 Older methods of collecting samples from monkeys are not very efficient and require anesthetization. Techniques such as drawing blood or using oral swabs put both the monkeys and the handlers at bodily risk. To complicate matters, the monkeys' innate intelligence enables them to evade capture when threatened. For a long time now, there has been a need for a better way to safely screen these animals for the harmful pathogens they may carry. How Do Viruses Get From Monkeys to Humans? Between 1940 and 2004, greater than 70 percent of emerging zoonotic diseases in humans originated in wild animals. And, over time, the incidence of emerging infectious diseases caused by wildlife pathogens has increased. Some pathogens, such as herpes B, are ubiquitous among certain species of primates and can be contracted by humans through direct contact with saliva--most commonly, through a monkey bite. But a virus can only be passed to humans if the monkey is actively shedding a contagion in their oral cavity. To put it simply, someone bit by a monkey infected with herpes B would not contract the virus if it wasn't present in the monkey’s mouth during the transgression. Other viruses, like yellow fever, can be passed indirectly among human and non-human primates through mosquito bites. The new, non-invasive technique for screening wild primates is now being established as part of a global plan to keep pandemic diseases at bay. Last year, The United States Agency for International Development awarded 100 million dollars to initiate this next stage of the PREDICT project, led by the U.C. Davis One Health Institute. At the California National Primate Research Center, captive-bred rhesus macaques were given various lengths of jam-covered rope. 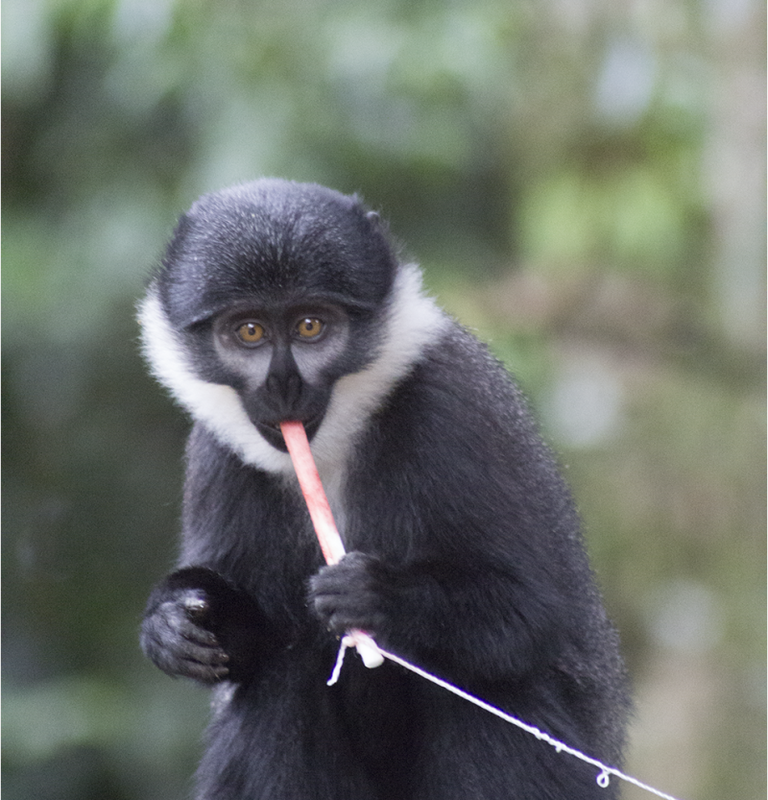 Many of the ropes were equipped with retrieval strings to make them easier to collect after the monkeys were done chewing on them. After recovering the ropes, the saliva could be tested for primate DNA and RNA viruses. It turns out monkeys do have some preferences. The theory is that monkeys have an ingrained, evolutionary fear of anything resembling a snake. The answer is simple. Because it is affordable, easy to get anywhere in the world, and the monkeys can't seem to get enough of it. With successful results at the primate center, the PREDICT team can now use the same techniques on the free-ranging olive baboons, red-tailed guenons, rhesus macaques, and l'hoest monkeys that populate the villages of Uganda and sacred temples of Nepal. "All species accepted the ropes with fruit jam applied as an attractant except baboons," Smiley says in her recent study. "The rope had to be completely disguised inside a banana in order for them to chew on it." 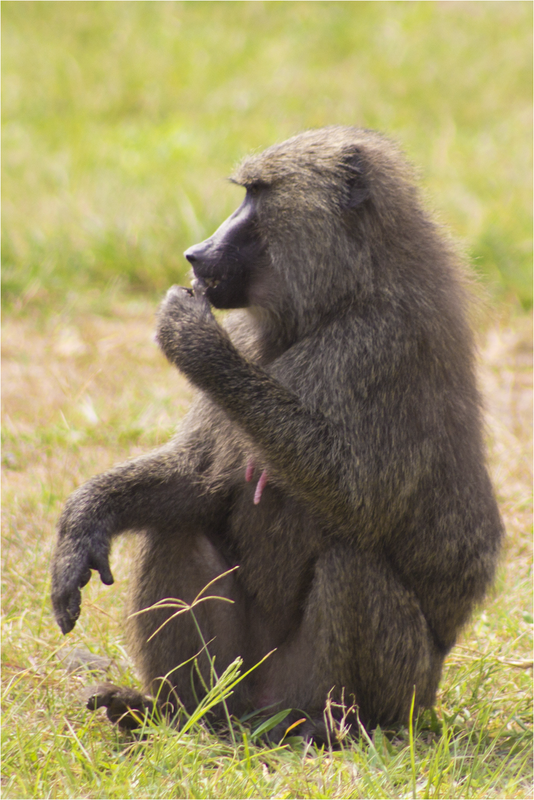 Baboons are also wary of the retrieval strings. 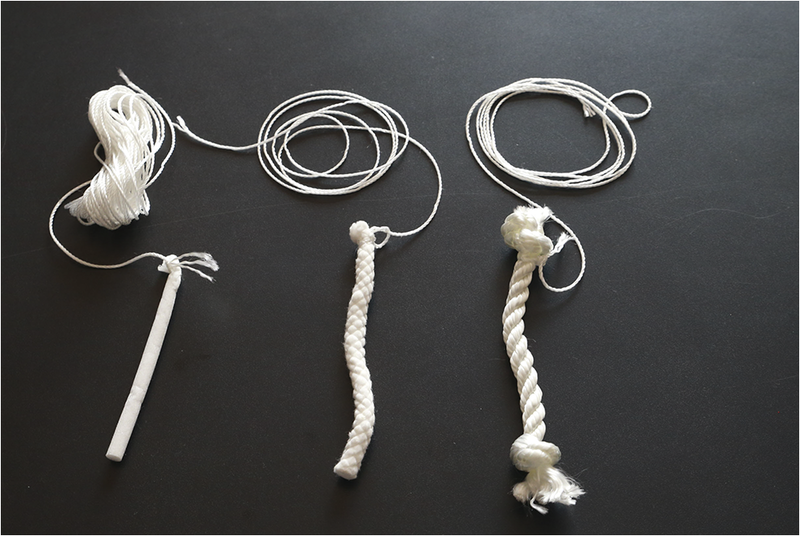 Team members have to collect the actual chewed rope, which presents a whole new obstacle in making this method commonplace. "It is important to be able to sample more groups of primates that may be challenging to collect samples from. But on the other hand," Smiley says, "we want to make sure it’s done very discreetly and that there is no way you attract more human-primate interaction." Smiley's methods keep evolving. 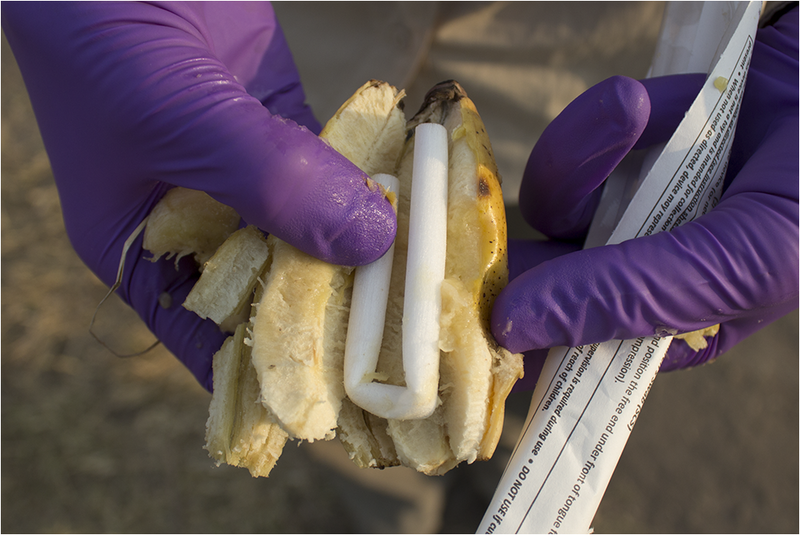 She is currently working on a non-invasive sampling technique which involves gathering chewed plants to test for primate viruses. "This is an even more non-invasive method," she says, "because it can be used with endangered species in which ropes can't be used."